Blankets, booties and bunny rugs make good gifts for new babies but blocks make a sensational gift, particularly if they blur the line between plaything and decor piece. I discovered the gorgeous Etsy store, Tiny Giraffe, when searching for paper dolls (my previous posts are testimony to my paper doll love). However, little fingers and delicate paper dolls generally don’t mix so I was delighted to find these fabulous blocks. 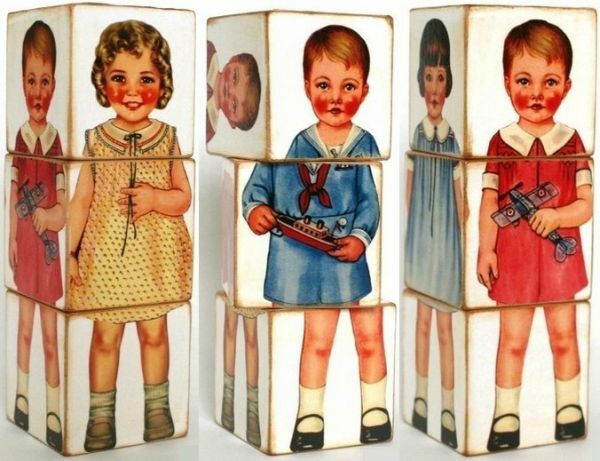 Six vintage paper doll designs on three chunky blocks are just right for toddler-size hands. For blocks with a modern edge, the Mod Retro or Lotus designs are simply beautiful. Different prints on each block face can be mixed up for playtime or arranged strategically as a decor piece. There are also other designs including zoo prints and vintage alphabet blocks. As a perfect finishing touch, give the blocks in a Tiny Giraffe personalised cotton drawstring bag. Paper doll blocks are US$20 a set, Mod Retro and Lotus blocks begin at US$15 a set of three and personalised drawstring bags are US$3.75 each. Tiny Giraffe ships to Australia.